Why can’t we just turn off nuclear reactors? 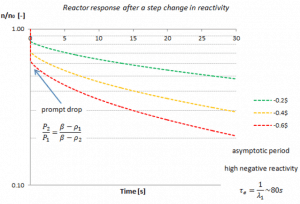 Why do reactors have to be cooled for long periods, while the chain reaction can be stopped almost immediately? There is an extra energy source known as decay heat, that contributes to thermal power in power operation, but dominates in shutdown mode. Decay heat is the heat released as a result of radioactive decay of fission products accumulated in the fuel. To understand the processes that are after reactor shutdown, we have to explain the term “residual heat”. At power operation, the fission reaction is responsible for the power generated in a nuclear reactor, and the fission reaction rate is proportional to the neutron flux, so you might expect that thermal power output is proportional to nuclear power. The relationship between flux and thermal power, however, is not linear. In other words, after reactor trip, the nuclear power drops almost immediately, since the chain reaction is stopped almost immediately. On the other hand the thermal power decreases more slowly, for example, due to decay heat production. In this case the thermal power output is not, by no means, proportional to nuclear power. In power operation, the fuel and all structural materials contain huge amounts of accumulated heat. Note that, central region of fuel pellets can reach up to 1000°C. After reactor shutdown, also this heat must be transferred into the reactor coolant. This component of residual heat dominates in first seconds after shutdown, but disappears after about 30 seconds. After a large negative reactivity addition the neutron level undergoes a rapid decrease of about two decades (prompt drop) until it is at the level of production of delayed neutrons. But even if it were possible to insert an infinite negative reactivity, the neutron flux would not immediately fall to zero. Prompt neutrons will be absorbed almost immediately. After the prompt drop, the neutron flux continues to fall according to stable period. The shortest negative stable period, that originates from the last group of delayed neutrons, is τe = – 1/λ1 = -80s. The neutron flux cannot be reduced more rapidly than this period. On the other hand, the prompt drop causes an immediate drop to about 6% of rated power and within few tens of seconds the thermal power which originates from nuclear fission is below the thermal power which originates from decay heat. Generally, reactor coolant pumps are very powerful, they can consume up to 6 MWe each. About two-thirds of its power input appears as heat, known as pump heat, in the reactor coolant (about 16 MWth) as long as the reactor coolant pumps are operated. Heat is generated by fluid friction in the turbulent flow and depends on the fluid viscosity and the flow rate. This flow is forced just by reactor coolant pumps. In a nuclear reactor, the average recoverable energy per fission is about 200 MeV, being the total energy minus the energy of the energy of antineutrinos that are radiated away. About 6 percent of the 200 MeV produced by an average fission is released with delay at some time after the instant of fission. This energy comes from the beta and gamma decay of fission products and transuranic elements accumulated in the fuel rather than directly from the fission process itself. Most of these fission products are highly unstable (radioactive) and undergo further radioactive decays to stabilize itself. 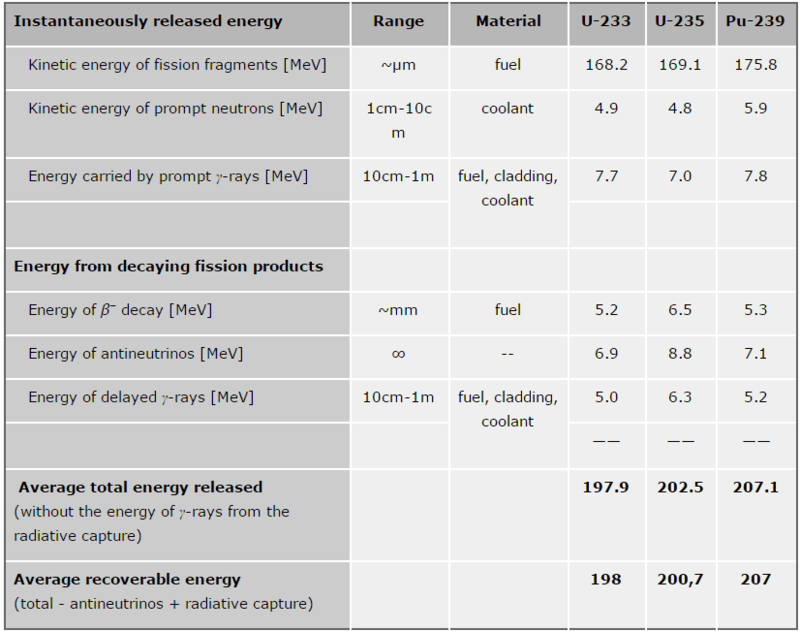 On average, after each U-235 fission the neutron-rich fission fragments must undergo 6 negative beta decays (6 neutrons must decay to 6 protons). Absorption of this radiation in the fuel generates significant amount of heat even when a reactor is shut down. When a reactor is shut down, fission essentially ceases, but decay energy is still being produced. The energy produced after shutdown is referred to as decay heat. 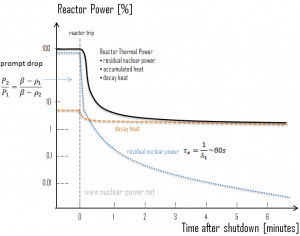 The amount of decay heat production after shutdown is directly influenced by the power history (fission products accumulation) of the reactor prior to shutdown and by the level of fuel burnup (actinidies accumulation – especially in case of spent fuel handling). 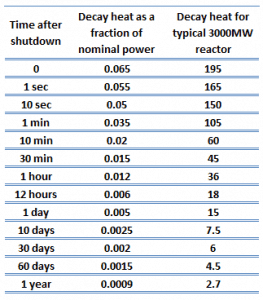 A reactor operated at full power for 10 days prior to shutdown has much higher decay heat generation than a reactor operated at low power for the same period. 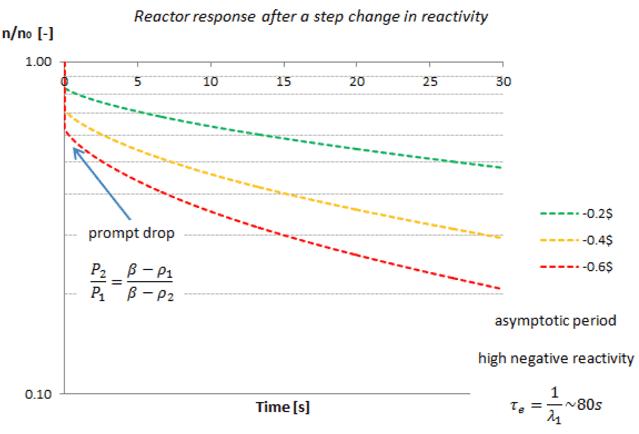 On the other hand, when the reactor changes its power from 50% to 100% of full power, the ratio of decay heat to neutron power drops to roughly half its previous level, and then builds up slowly as the fission product inventory adjusts to the new power. 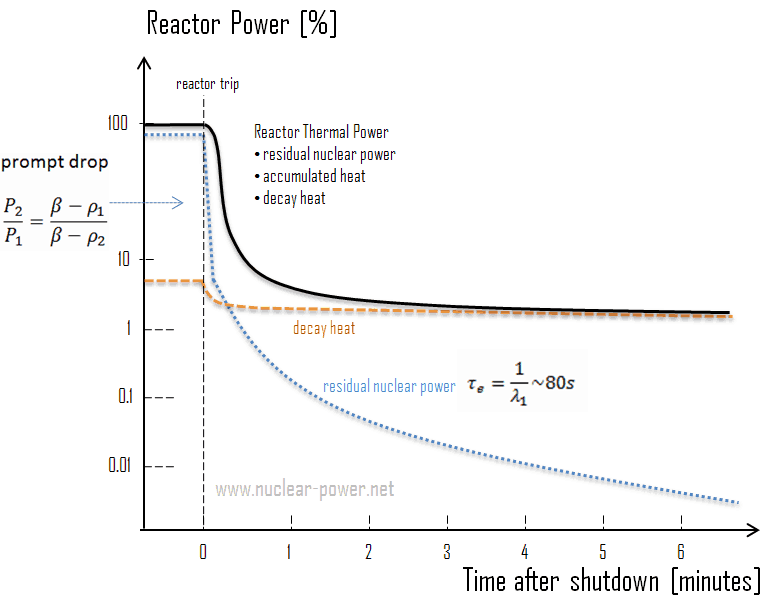 The decay heat produced after a reactor shutdown from full power is initially equivalent to about 6 to 7% of the rated thermal power. Since radioactive decay is a random process at the level of single atoms, it is governed by the radioactive decay law. 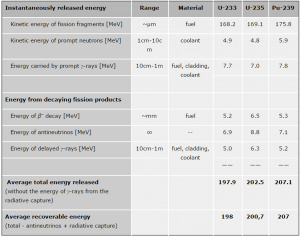 Note that, irradiated nuclear fuel contains a large number of different isotopes that contribute to decay heat, which are all subject to the radioactive decay law. Therefore a model describing decay heat must consider decay heat to be a sum of exponential functions with different decay constants and initial contribution to the heat rate. Fission fragments with a short half-life are much more radioactive (at the time of production) and contribute significantly to decay heat, but will obviously lose its share rapidly. On the other hand, fission fragments and transuranic elements with a long half-life are less radioactive (at the time of production) and produces less decay heat, but will obviously lose its share more slowly. This decay heat generation rate diminishes to about 1% approximately one hour after shutdown. As was written, the decay comes from the beta and gamma decay of fission products and transuranic elements (+ alpha decay). Energy of delayed β– decay. About 6 MeV of fission energy is in the form of kinetic energy of electrons (beta particles). The fission fragments are neutron-rich nuclei and therefore they usually undergo beta decay in order to stabilize itself. Beta particles deposit their energy essentially in the fuel element, within about 1 mm of the fission fragment. Energy of delayed gamma decay. Gamma rays usually accompany the beta decay. The gamma rays are well attenuated by high-density and high Z materials. In a reactor core the largest share of the energy will be deposited in the fuel containing uranium dioxide, but a significant share of the energy will be deposited also in the fuel cladding and in the coolant (moderator). The range of gamma rays in a reactor vary according to the initial energy of the gamma ray. It can be stated the most of gammas in a reactor have range from 10cm – 1m. Decay of fission products. Decay of fission products is dominating source directly after shutdown and in periods up to years. Decay of activated structural materials by radiative capture. Decay of activated structural materials is minor contributor to overall decay heat. See also: ANSI/ANS-5.1-2014, Decay Heat Power in Light Water Reactors. American Nuclear Society, 2014. However, even at these low levels (about 1% after one hour), the amount of heat generated requires the continued removal of heat for an appreciable time after shutdown. Decay heat is a long-term consideration and impacts spent fuel handling, reprocessing, waste management, and reactor safety. The design of the reactor must allow for the removal of this decay heat from the core by some means. If adequate heat removal is not available, decay heat will increase the temperatures in the core to the point that fuel melting and core damage will occur as in the case of Three Mile Island and Fukushima. 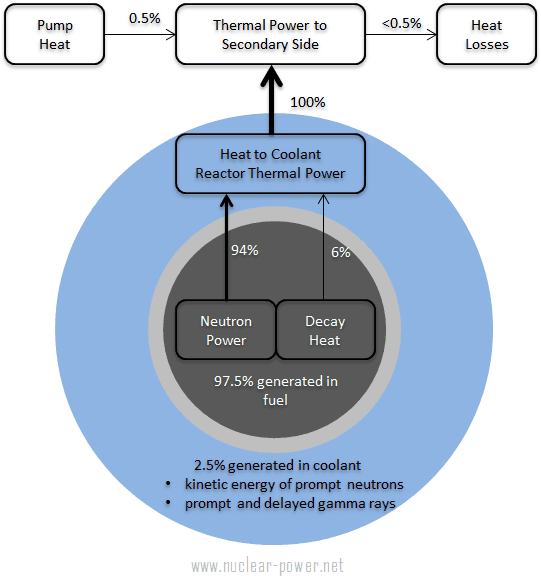 The degree of concern with decay heat will vary according to reactor type and design. Therefore, there is little concern about core temperature due to decay heat for low power, pool-type reactors. Closed Loop System. One category includes methods which circulate fluid through the reactor core in a closed loop, using some type of heat exchanger to transfer heat out of the system. Heat Removal through Steam Generators. Steam generators can be and are usually used to remove decay heat from a reactor. They dissipate heat directly to the main condenser or via the atmospheric steam dump system. In this operational mode a some of reactor coolant pumps (RCPs) must be usually in operation or natural circulation must be remained. Heat Removal through RHR. The residual heat removal system (RHR) is a low-pressure heat removal system. In PWRs, it takes water from one or two RCS hot legs, cools it in RHR heat exchangers, and pumps it back to the cold legs or core flooding tank nozzles. To accomplish RHR heat removal, RHR heat exchangers transfer heat to the component cooling water or service water system, which then transports heat to the ultimate heat sink (UHS). Open System: The other category includes methods which operate in an open system, drawing in cool fluid from some source and discharging warmer fluid to some storage area or the environment. Decay heat removal using feed-and-bleed method. The feed-and-bleed method for decay heat removal becomes necessary method in some pressurized water reactors (PWRs) if there is a loss of steam generator heat sink capability. The feed-and-bleed technique involves passing hot coolant out of the primary system through a pilot-operated relief valve (PORV), while simultaneously feeding the primary system with subcooled coolant through high pressure safety injection system (HPSI), which is part of the emergency core cooling system. The amount of decay heat being generated in a fuel assembly at any time after shutdown can be exactly calculated the determination of the amount of fission products present at the time of shutdown. This is a fairly detailed process and is dependent upon power history. For a given type of fuel, the concentrations, decay energies, and half-lives of fission products are known. By starting from a known value, based on power history at shutdown, the decay heat generation rate can be calculated for any time after shutdown. An exact solution must take into account the fact that there are hundreds of different radionuclides present in the core, each with its own concentration and decay half-life. For this purposes the SCALE/TRITON code can be used for depletion calculations and SCALE/ORIGEN-ARP code can be used for calculation of decay heat rates at specific initial fuel composition and discharge burnup level. See also: Brian J. Ade, Ian C. Gauld. 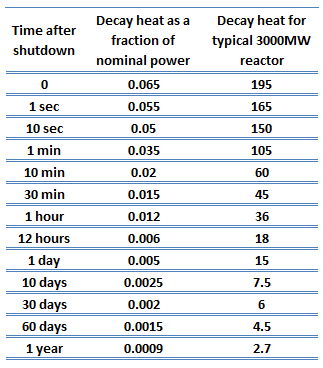 Decay Heat Calculations for PWR and BWR Assemblies Fueled with Uranium and Plutonium Mixed Oxide Fuel Using Scale, ORNL/TM-2011/290, OAK RIDGE NATIONAL LABORATORY, 2011.
t = time, in seconds, elapsed since shutdown.